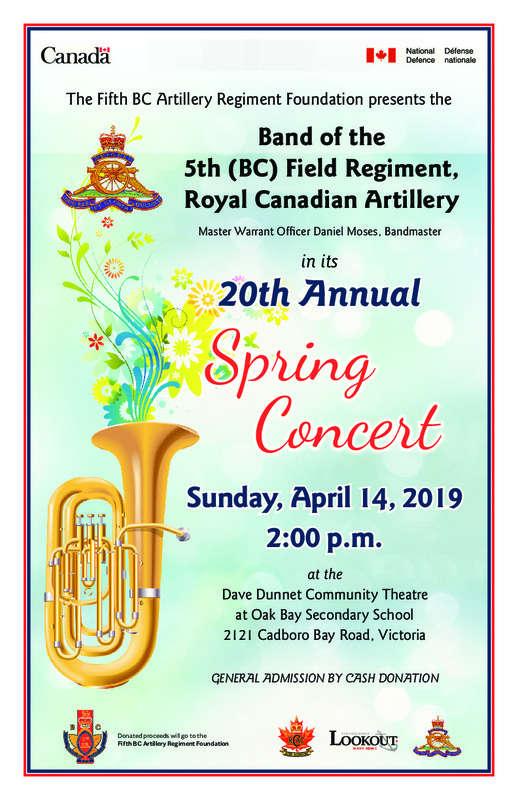 The Band of the 5th (BC) Field Regiment, Royal Canadian Artillery, presents its 20th Annual Spring Concert at the Dave Dunnet Theatre (Oak Bay Secondary School) on Sunday April 14 at 2:00 p.m. The concert features a wide variety of band music the whole family will enjoy, from marches to medleys to movie music. There's even a piece written for sandpaper and band! It's sure to be a lovely afternoon of light music and toe-tappers. Admission is by cash donation, with proceeds going to the not-for-profit Fifth BC Artillery Regiment Foundation. The Band of the 5th is a unit of the Canadian Armed Forces Primary Reserve and is the only Army Brass-Reed band on Vancouver Island. It's been in Victoria since 1864, making it the oldest continually-operational band west of Thunder Bay. The players in the Band are Reservists and civilians, so if you are looking for an awesome part-time job, with great pay and benefits, or just a place to play, consider checking out the Band. Rehearsals are Tuesday nights at Bay Street Armoury. Call (250) 363-8203 or check out http://www.5fieldband.ca for more information.